You are here: Home > The reason why Earth’s climate creates destruction from a 1°C rise in temperature: It’s a mind-boggling amount of energy. Since the Industrial Revolution the global average temperature has increased by nearly one degree, mostly in the last forty years. One degree is barely discernible. Yet it is blamed for widespread destruction! How can it be so? One degree adds the energy of maybe a million big hydrogen bombs to the upper ocean. It’s an easy calculation; you can check it for yourself. The sun is a thermonuclear reactor that blasts Earth with enough energy to roast the air and fry the land and dry the sea. Clouds and land reflect or reradiate most of this energy. The absorbed energy ends up mostly in the ocean surface. Some parts get more than others. Over time winds and waves mix the energy from that average one degree into a layer roughly 200 meters (or 650 feet) deep. Earth’s oceans cover some 360 million square kilometers (or 3,875 trillion square feet). Multiply by the depth of the mixed layer and by the density of water (1 tonne per cubic meter or 62.4 lb per cubic foot), we estimate about 72,000 trillion tonnes (or 160 million-trillion pounds) of warmed water in the layer. It takes 4.2 joules of energy to warm one gram of water 1.0 °C (or 1.0 BTU of energy to warm one pound of water 1.0 °F). So the total extra energy E in the warmed water is roughly 300 billion-trillion joules (or 286 million-trillion BTUs). The energy these numbers represent is hard to grasp, so here’s a way to think of it: The biggest hydrogen bomb explosion ever filmed released energy equivalent to 1.6 million tons (Mt) of TNT. A 50 Mt bomb—the biggest ever tested—could literally flatten a big city. How many of them would it take to match that extra energy E lurking in the oceans? One megaton of TNT equals 4.2 million-billion joules. 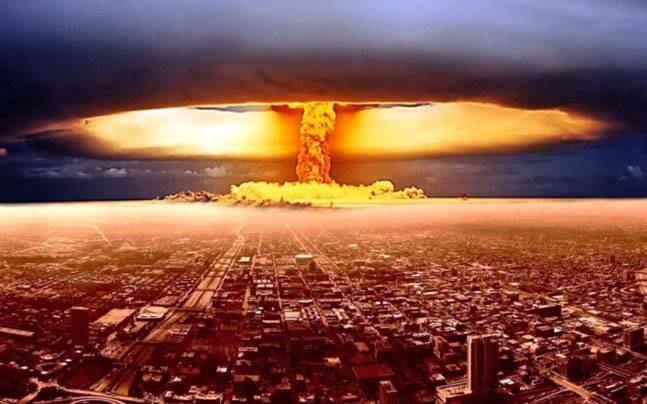 A 50Mt bomb would release 210 million-billion joules or 198 trillion BTUs. Dividing this into the extra energy E shows we have the energy of about 1,440,000 big bombs stored in the warm sea surface. Do the numbers: That’s a vast blast once a minute round the clock for almost three years. Can warm seawater safely suppress the explosive energy? Unfortunately, not. Hurricanes are heat engines that harvest energy from warm seawater in the form of moist air. A hurricane is a machine that emerges from moving molecules like a moist-air vacuum cleaner: a molecule of H2O (molecular weight 18) is lighter than a molecule of nitrogen or oxygen (28 and 32) so the air near the sea surface rises, sucking more moist air in. Coriolis forces from the Earth’s rotation cause the air mass to rotate. A big hurricane’s rotation entrains more than a trillion tons of high-speed air. Its destructive winds drive high tides. The motion of this air mass can consume around a ten-thousandth of the oceans’ extra energy; that’s the energy from warming the Earth’s upper oceans by only 0.0001°C—but still more than a hundred 50-Mt-bombs’ worth. 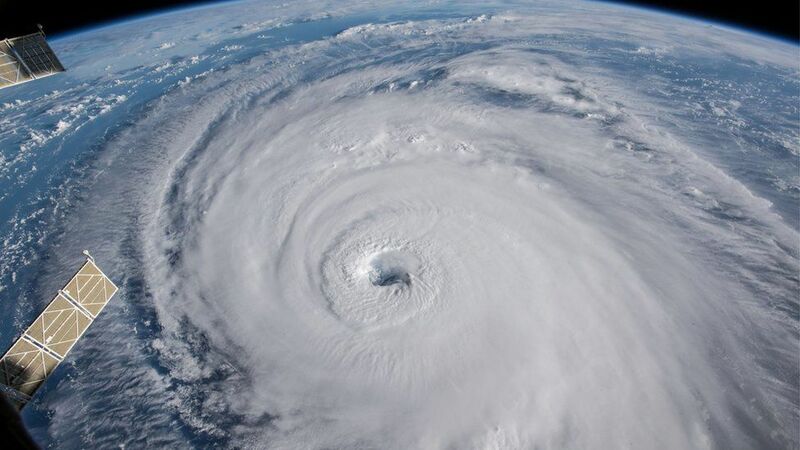 A big hurricane also lifts millions of tons of water vapour up to ten miles above sea level. This lift requires mere millionths of the oceans’ extra energy but, as the vapour cools and condenses, torrential rains can do more damage than the winds. The question often asked is: Did climate change cause this storm? Now you can see why this is the wrong question. The right question: Did climate change make this storm worse? And the answer: It sure did. Now you know how even one degree makes all storms worse. Two degrees will add much more than double. Please share this with your friends and maybe plan a carpool. So why is the number of hurricanes decreased in the last ten years? I am hearing 5 C increases not out of the question over the next 30 or so years if that is true how can we stop the damage ? Craig, local effects vary and 5C average locally may happen with a 1.5C global increase and will likely be severely damaging locally. A 5C global average increase would be a world-scale disaster with human civilization unlikely to survive. He forgot to metion one major factor, is sun’s radiation energy on earth constant throughout the last passing 300 years? Otherwise all those n+hydrogen bombs energy equvilent data are not substantial. Sorry ,wrong spelling,substantial instead of sustancial. Thanks Chuen, you are right, it is a factor and so much studied. But its variation is not enough to make any difference in this “order of magnitude” type of calculation.